The Rays have done it again. For the second time in four years, they've signed Evan Longoria to a surprising long-term contract extension that will keep the third baseman in Tampa Bay for the foreseeable future. The Rays announced that they extended Longoria for an additional six seasons by guaranteeing three club options on his previous deal and adding $100MM in new money to the contract. Longoria will now earn $136MM from 2013-22 under his contract, which includes a club option for 2023. The contract incorporates the 2013-15 salaries from Longoria's original deal with the Rays and increases his 2016 salary, meaning the third baseman will earn $6MM in 2013, $7.5MM in 2014, $11MM in 2015 and $12.1MM in 2016. Longoria receives a $1MM signing bonus and will earn $13MM in 2017, $13.5MM in 2018, $14.5MM in 2019, $15MM in 2020, $18.5MM in 2021 and $19.5MM in 2022. His 2023 option is for $13MM and carries a $5MM buyout. Additionally, the new contract pays Longoria a $2MM bonus if he's traded to another team. Under his previous deal, the Rays had club options for the 2014-16 seasons. Rays executive VP of baseball operations Andrew Friedman said it made sense for the team to sign Longoria for the next decade. 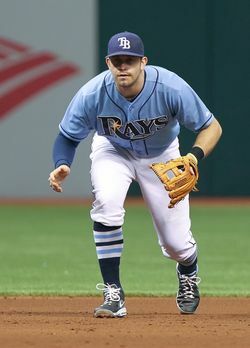 TWC Sports represents Longoria, whose previous contract was often cited as one of the most team-friendly deals in the game. The Rays signed Longoria to a six-year, $17.5MM contract six games into his MLB career. The deal, which included three club options, did establish a new record for guaranteed money obtained by a player with so little service time. In the four years since he signed his deal with the Rays, he has become their best player. Longoria played in just 74 games this past season. He suffered a partially torn hamstring in April and spent much of the season on the disabled list. Last week Longoria underwent a minor hamstring procedure that doesn’t affect his timeline for the 2013 campaign. Longoria was the third overall selection in 2006 and the first player drafted under Sternberg and Friedman. In five seasons at the MLB level, he has a .276/.361/.516 batting line with 130 home runs. Statistically minded readers will note that he has produced nearly 30 wins above replacement in that time (29.3 per FanGraphs and 28.5 per Baseball-Reference). The three-time All-Star has a pair of Gold Gloves that were well-earned according to defensive metrics and traditional observers alike. This extension doesn't compare particularly well to other deals since Longoria was so far removed from free agency and had been playing under a unique deal. The deal does resemble the contract signed by Ryan Zimmerman and the Nationals this spring in that both third basemen added six years and $100MM to pre-existing contracts after seasons in which they were limited by injuries. Longoria will donate more than $1MM to the Rays Baseball Foundation over the life of the contract, the team announced. Roger Mooney of the Tampa Tribune and Marc Topkin of the St. Petersburg Times reported the details of Longoria's new contract.